How many people can truly say they are among the very best at what they do? Not just the best in their class in school, or that they do their job better than anyone else at the office, or even those who are the best at something in their town be it gardening or gopher catching, but rather among the absolute best at their profession in the entire world? Of all the kids ever forced to take piano lessons how many actually wind up performing in front of a paying audience or who get the chance to record? Not many. Of those who get that far how many of them start trends that sweep the music world and are acclaimed for their abilities from all those in the know and who are constantly in demand in studios across the country for a solid decade? A handful of them, if that. Pete Johnson was one of those who achieved all of that and during the 1940’s he was among the five or ten best pianists in the world. Yet before the decade was over he was starting to see opportunities to record under his own name slowly grind to a halt, all before he reached middle age. No wonder the record signaling the fading of his once bright star is called Skid Row Boogie for that’s too often where pianists of his ilk wound up in spite of their all around brilliance… disposable musicians cast aside and destined to be all but forgotten by the world they once electrified with their playing. We’ve met Pete Johnson a few times here on Spontaneous Lunacy as he played in support of others, something that would always be his primary role, one which he was well suited for, able to subject himself to another artist’s ego while still indulging in some tasty licks on his own. 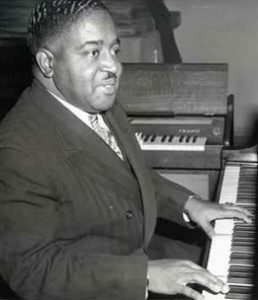 Johnson’s best work to date in rock came behind Crown Prince Waterford on the storming Move Your Hand, Baby but it was with Big Joe Turner that Johnson would forever be linked. The two had come of age together in Kansas City where Johnson, a few years older, was already establishing himself as the town’s premier pianist when an underage Turner showed up at the club where Johnson held court and got a job bartending and singing, the two of them developing an uncanny ability to play off one another, Turner ad-libbing lyrics endlessly while Johnson improvised behind him. When the two were recruited by legendary talent scout/producer John Hammond to play the inaugural From Spirituals To Swing concert at Carnegie Hall in New York in December 1938 they promptly stole the show, launching the national boogie woogie craze in the process. Their success with that style established them as stars around New York where they had their pick of working the best clubs in The Big Apple for years until the war came along and changed the musical sentiments of the country overnight. Turner and Johnson, though still notable names, were set adrift, each one looking to find a niche in which they could excel as they had with boogie woogie. While Turner never had a shortage of interest amongst record labels, Johnson, by virtue of merely being a piano player rather than a vocalist, was resigned to being a largely anonymous session musician. Turner and Johnson would still frequently be enlisted to record together and when the former found himself signed briefly to the Down Beat label in Los Angeles it was Johnson who was called on to lead the band. In the bargain the company decided to also cut a handful of instrumentals on Johnson in hopes that they might be able to connect with the burgeoning rock audience. All things considered it wasn’t a bad bet to make. The first sounds of this, the repetitive boogie bass opening, sounds as if it’s on the wrong speed. It’s almost a half step too quick for the mood you’re expecting for this specific progression. As a result it disarms you a little, making you sit up and take notice more than you might’ve had it fallen into the slower tempo such a pattern anticipates. Once he compliments it with his right hand it starts to take shape and as he’s joined by the horns and drums you can see the skill at which this was constructed. In terms of opening salvos this is first rate, building to a release rather than coming charging out of the gate leaving yourself with nowhere to go. But as to how effectively Skid Row Boogie can keep this up that’s a different proposition entirely. For if there’s one thing we’ve found out thus far in rock it’s that while the piano is perfectly suited for adding flavor to any song as an accompanist, as the primary component to an arrangement – especially one without vocals to offset it – the piano has some inherent disadvantages starting with the fact that it’s an inflexible instrument. Whereas horns and guitars can stretch and bend notes, shift their tones and vary their sound accordingly, the piano is hampered in that regard. That’s not to say the sound it produces, especially with someone as skilled as Johnson hammering the keys, is inferior to other instruments, but it’s somewhat limited… hemmed in by the lack of hues and shadings it can produce. Now on flat out pounding boogies – of which this is not – that hardly matters. Then the goal is to get you moving and grooving until your heart is pounding and you’ve lost twelve pounds in perspiration, but on every other type of instrumental the pianist has only so many options to choose from and as a result the tracks which feature it prominently sometimes can’t help but sound a bit redundant. That’s where other instruments become all the more vital, their ability to add to the sonic palette and flesh the sound out is often what will make or break a piano led track. Of particular importance here are the horns, not surprising considering how they were carrying rock’s bags at the time, and the gently swaying riffs that they feature when they join in are pretty intoxicating as Johnson’s right hand adds the right insistently whimsical touch. When Maxwell Davis’s tenor sax takes a solo midway through the focus shifts to something more familiar for the era, a touchstone that was surely designed to connect it to what rock fans were clamoring for most over the past year. Unlike a lot of the more gaudy show-stopping hits of the day it’s more melodic than it is bawdy yet never veers into jazz territory, sticking firmly in the rock alley but it makes sure not venture too far into the shadows, preferring instead to keep one eye on the safer environs under the streetlights and the theater marquees. Skid Row Boogie may be its title, but this deftly avoids the gutter, its sound suggesting merely a drive through the seedier side of town with the windows rolled partway down to soak in the atmosphere from a distance. Distance is probably a good word to summarize the record and Johnson’s fit in rock ‘n’ roll at this point as well. Though as skilled as anybody on piano and with a vast résumé touching upon all of the styles that went into rock’s formative sounds, Johnson, by virtue of his age (just shy of 45 at the time), his background and his modest persona that better suited his role as a sideman rather than having the requisite ego of a frontman, would forever remain outside of rock’s inner circle. It wasn’t that he couldn’t play it credibly, it was more that he wasn’t about to forcibly take it on and try and shape it to suit his own ideas. That’s just not the kind of person he was. Call it a case of being too passive, too malleable in his artistry, too used to being a serviceable component of somebody else’s vision rather than the visionary in his own right, Johnson had it in him in terms of talent to steer rock in an exciting direction but didn’t have it in him personally to take charge. Though what he plays on Skid Row Boogie is as solid as it gets, he winds up deferring to the other instruments, almost becoming an afterthought on his own record, simply because that’s what suited him best over the years. In many ways his ambitions had already been fulfilled when he got to be a professional musician, whereas for most rockers their ambitions weren’t satisfied until they became stars and even then for many that still wasn’t enough. As for the record itself, there’s nothing you can really point to as being unsuitable for rock, there’s no outdated ideas in the arrangement, no poorly chosen instruments being given the spotlight, no real flaws in the song’s construction. You can say that it might’ve done itself a favor by adding a third dominant soloing instrument to compliment the piano and tenor sax, bringing an added texture to catch your ear, but at this stage of rock what would that instrument likely wind up being? Probably not the electric guitar, which is what would suit it most, and so you’d probably end up with an obtrusive trumpet and we know how poorly that choice would play out. So you’re left with what it is – a well played but modest song that’s enjoyable while it lasts, but transient by nature. There’s nothing about it that holds you firmly in its grip, no riff that sticks in your mind after it ends, no compelling reason to HAVE to listen to it again which is what separates the great records from those which are merely suitable. Everything about it is fairly good but ultimately non-essential in the big scheme of things. Though it DID hit the Top Five in Cash Box’s regional charts in Pennsylvania of all places, it wasn’t something likely to vault him back into nationwide acclaim. With ever more songs by a growing list of artists all vying for your time and money Skid Row Boogie is something you’ll be happy to listen to when played, but won’t keep you up nights if you can’t track it down to own for yourself. Still, we’re delighted that Johnson actually got a chance to step into the spotlight even though it wasn’t where he longed to be. Ever the professional Johnson gave them what they asked and did it well enough for everyone to be pleased with the results, but when he pocketed the forty bucks or so they handed him his emotional commitment ended. Other artists, those who craved stardom, wouldn’t rest until they clawed their way to a hit, whereas I think Pete Johnson was just content that he was managing to avoid landing on skid row as long as somebody out there was willing to pay him to play the piano. Leave a reply on "Pete Johnson: “Skid Row Boogie”"